When an investor believes a stock is overvalued and will soon drop in price, he might decide to "short" it. First, he borrows an amount of the stock, and then sells it. He waits for the stock to tank before buying back the same amount of shares at a deflated price. After returning the shares to his lender, he pockets the difference―unless any one of several hard-to-predict variables interferes, and the stock fails to drop. Since these variables are so hard to predict, short selling is difficult for even seasoned investors. It takes great talent and experience to isolate the best short ideas for falling stocks―skills Amit Kumar developed and honed over decades of market analysis and trading. This book shares his short-selling framework, built on themes common to falling stocks and the market's endemic strengths and cycles. 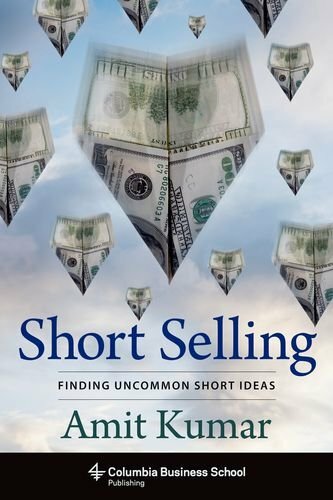 Featuring key case studies and exclusive interviews with successful fund managers Bill Ackman (Pershing Square Capital Management) and Mark Roberts (Off Wall Street Consulting Group), Kumar shows investors how to avoid traps and profit from well-researched short ideas. Investors may not always act on short ideas, but they can avoid losses by using Kumar's framework to identify overvalued stocks. Professionals and amateur investors alike will benefit from this fundamental research approach, which transforms short selling into a long-term strategy. If you have any questions about this product by University Press Group Ltd, contact us by completing and submitting the form below. If you are looking for a specif part number, please include it with your message.